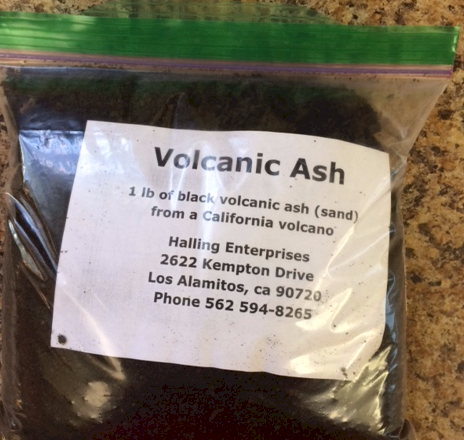 Re-mineralize your soil with rich black volcanic ash from a volcano rock quarry in the Southern California Desert. Volcanic ash soils are fertile due to their non-crystalline mineral content that reacts favorably with growing organic matter. They are powdery/sand in consistency and retain a high amount of water which is beneficial to plant growth. Additionally, volcanic ash rematerializes your soil with essential minerals needed for healthy pant growth. Volcanic ash is full of natural minerals and elements found in nature and will promote healthy plant growth. Rich volcanic soils bond well with organic materials, and may form a nutrient-rich layer that facilitates the growth of plants. Minerals in the volcanic ash form a chemical reaction when exposed to the atmosphere, allowing them to be utilized by plants as nutrients.